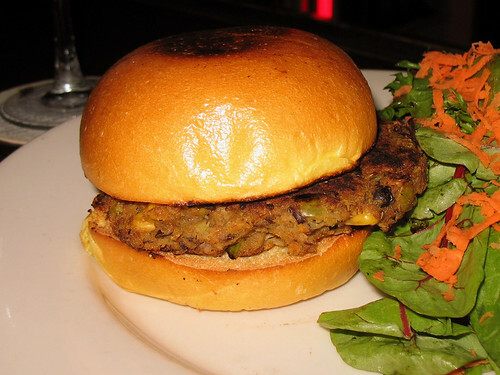 I came to the Belgian room for drinks and Belgian Frites after work one evening, but when I found out they had just added a veggie burger to their menu (something I had suggested to them before! Don’t underestimate the power of vegetarians asking for more options on the menu!) I immediately ordered it. 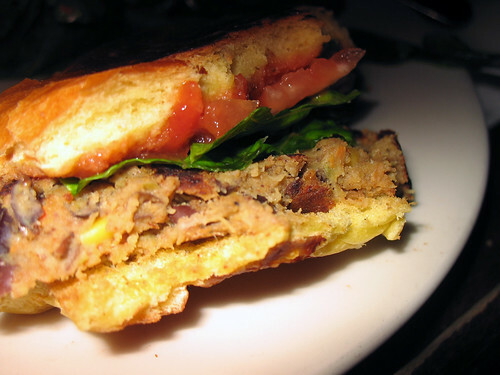 They told me the patty was one they made themselves, with black beans (and eggs – sorry vegans!) so I was quite eager to taste it. It was served to me with no toppings – although a bottle of ketchup was offered. I tried it first as it was, and I must say it was a pretty tasty burger. Not too spicy, but the beans were pretty flavorful and the texture was soft and rich. I mentioned (constructive feedback!) that they should serve it with at least some lettuce and tomato, which were then brought out for me, and did add a nice crunch and juiciness to the whole thing. The bun was toasted (always a good thing), and pretty good although it was not as memorable as some amazing ones I have tried. Since they have made a few changes to the menu, including the addition of the veggie burger, it sounds like they are still perfecting things – and might end up coming up with specialized toppings for the burger eventually. Since they have so many tasty dipping sauces for the fries (I am partial to the chipotle mayo, myself) I can imagine those flavors would adapt easily to a veggie burger. Overall, I am quite thrilled that a bar I have often visited now has an entrée on their menu that I can actually order. First the GO Burger truck adding veggie burgers to their permanent menu, now the Belgian Room… this city is becoming even more vegetarian-friendly by the minute! That's so weird that they would serve it without any accoutrements. Lettuce, tomato, onion, pickle...pile it on, people!